I’m not talking about those movies here. I want to talk about the other kind of horror movies I loved as a child: the kind that just don’t hold the same power over me anymore. I think in my early childhood I may have actually liked this a little more than the original King Kong (also 1933). It’s a softer, gentler movie, a sweet fairy tale with none of the horrifying implications of its predecessor, and the tragic ending really got to me. I was a sap and a sucker. 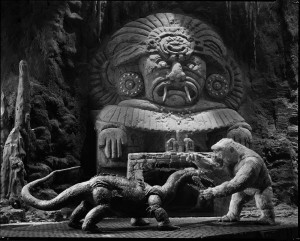 Son of Kong is competently produced, but it’s pointless, cheesy and manipulative, undercutting everything that was really effective about the first picture. 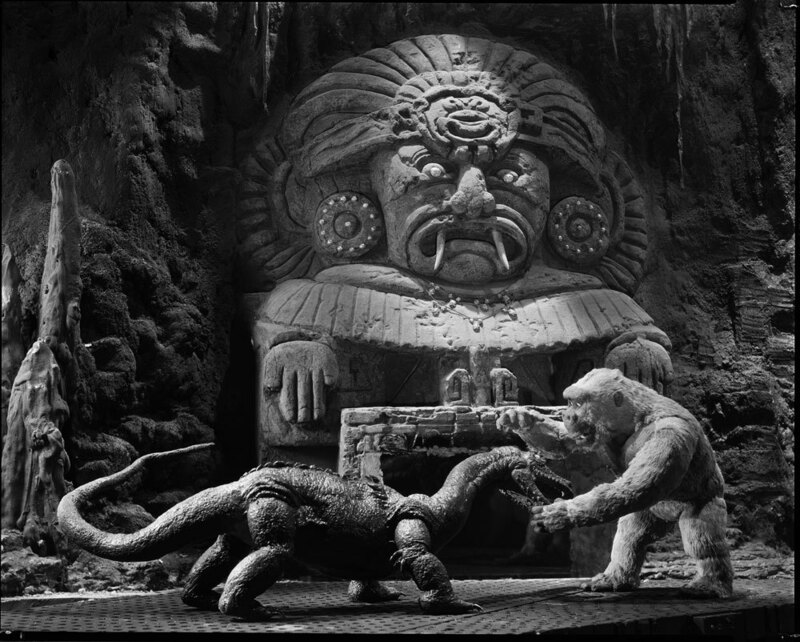 It was the dark edge, the truly scary quality, that gave King Kong its tension, and that made the sweet and gentle side of the character so impactful. 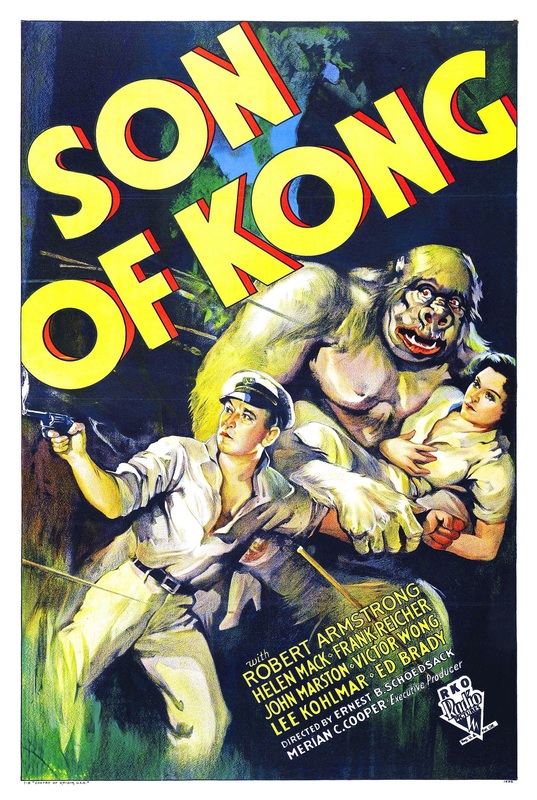 His affection for Anne, his nobility and the cruelty of his fate, these things all ring true because they exist as parts of a more complex whole, with every character – Kong included – having both positive and negative traits. The characters in Son of Kong – Baby Kong included – are a bunch of saints and lovable goofs, devoid of nuance. It’s not sweet, it’s sappy and blatantly, artlessly manipulative. This one is kind of painful for me. I mean, when I was young, I loved The Return of the Vampire. LOVED it. Bela Lugosi only played Count Dracula on the big screen twice, in Dracula (1931) and Abbot and Costello Meet Frankenstein (1948), but in The Return of the Vampire he was playing his signature role in everything but name (the character is called Arman Tesla), and that alone made it something special for little classic-horror-loving me. Then there was Matt Willis as Andreas, the werewolf enslaved by Tesla. 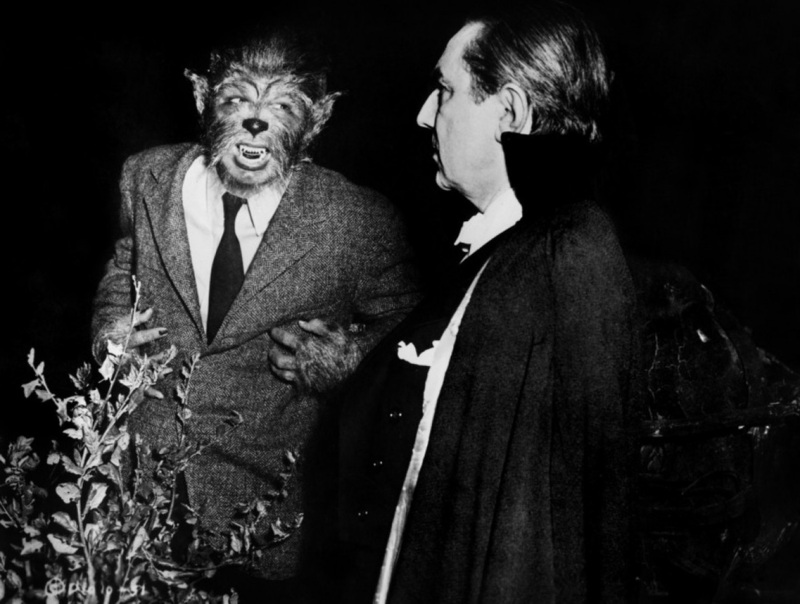 Werewolves were a serious favorite monster of mine as a kid; The Wolf Man (1941) was a movie I absolutely obsessed over, and Werewolf of London (1935) ranked highly among my favorites as well. Those movies presented two very different takes on the werewolf, in terms of both character and mythology, and Andreas represented a third unique version, a werewolf who very much maintained his intelligence and personality once transformed, and who could stave off his lycanthropic fits with enough faith in himself and in the forces of good. A werewolf who could be as threatening and as tragic as any other (in theory), but could also be one of the heroes of the story. 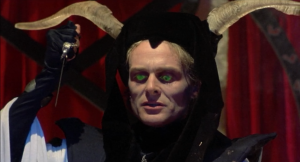 There are a ton of good ideas in The Return of the Vampire, and everything is competently assembled, but, really, that’s all it is: competent. The opening sequence is pretty effective, and the ending builds some excitement, but in between, it’s largely forgettable and, watched as an adult, pretty flat and unengaging. I dunno. At some point, I’ll definitely watch this one again, and maybe I’ll re-evaluate it completely. Maybe, remembering the disappointment that accompanied my last viewing, I’ll be pleasantly surprised. 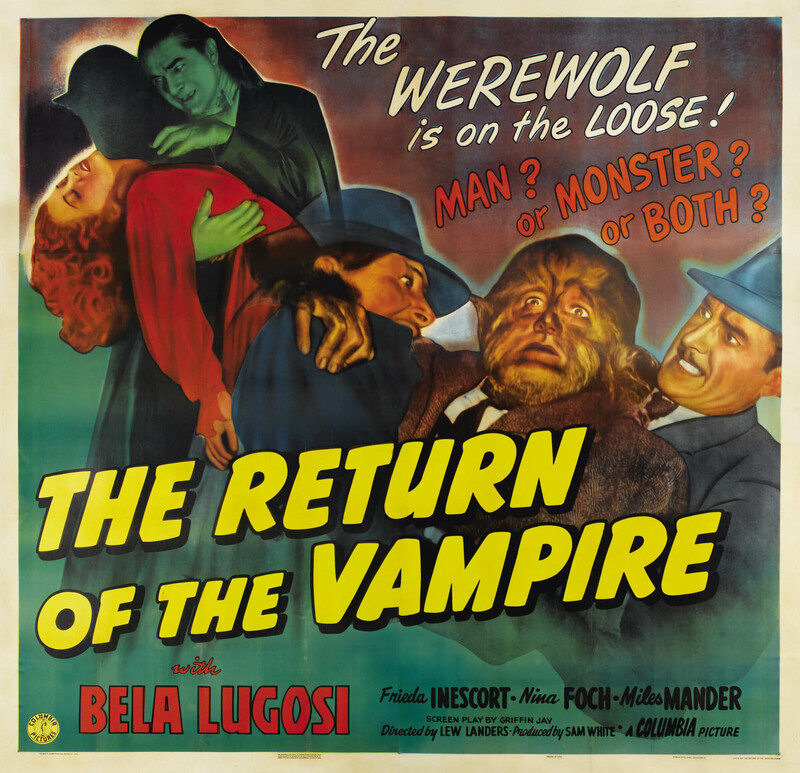 Maybe six months from now I’ll be posting an article on how The Return of the Vampire is actually kinda great. I hope so. I dearly want to love that movie again. It’s the movie that inspired this list, and it is BY FAR the most disappointing of the lot on adult re-watching. This one hit theaters in the US a little before my sixth birthday, so I can’t say for sure if I was five or six when I saw it, but I was somewhere just to one side of that line. Anyway, this was part of the big wave of post-Gremlins “little, mischievous monsters” flicks that also included Critters (see below) and the execrable Munchies (1987). 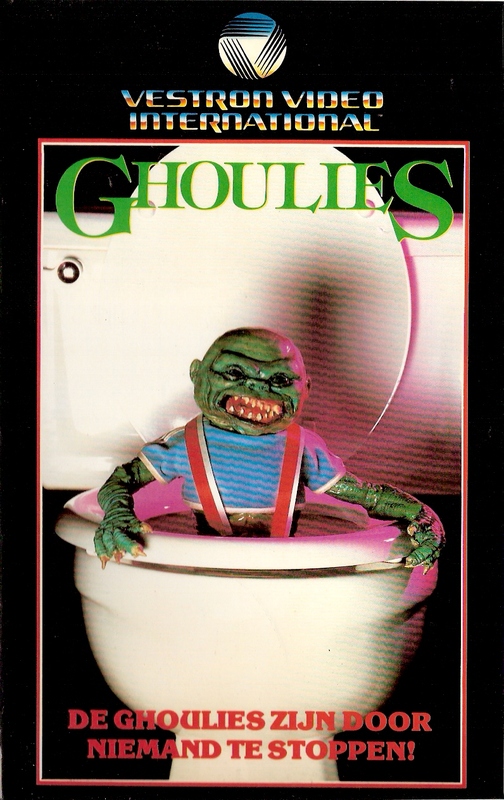 Ghoulies was in many respects the darkest of the lot; it felt a bit edgier, a bit more twisted than its kin. I also remember very clearly that every time I mentioned the movie to friends at school, they’d insist that I had the name wrong, and was talking about Goonies (1985). That may have been my first taste of pretentious pride in knowing something more esoteric than my peers, and it’s probably part of why I have such a snotty, dismissive attitude towards Goonies to this day. Watching it now… Okay, I appreciate that it doesn’t have a typical heroic lead, or really any kind of morally simplistic attitudes. But in the absence of a traditional good/bad dichotomy isn’t replaced by anything of substance. We don’t have an interesting anti-hero or villainous protagonist, just a bunch of obnoxious, unlikable characters whose fates mean literally nothing to the viewer. The narrative is muddled, the pacing is random, the photography is atrocious. There’s really barely a movie here at all. 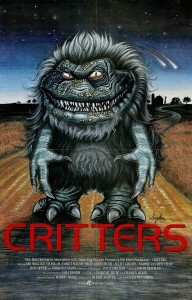 As a youngster, I always preferred Critters 2 (1988); it was funnier and more exciting. 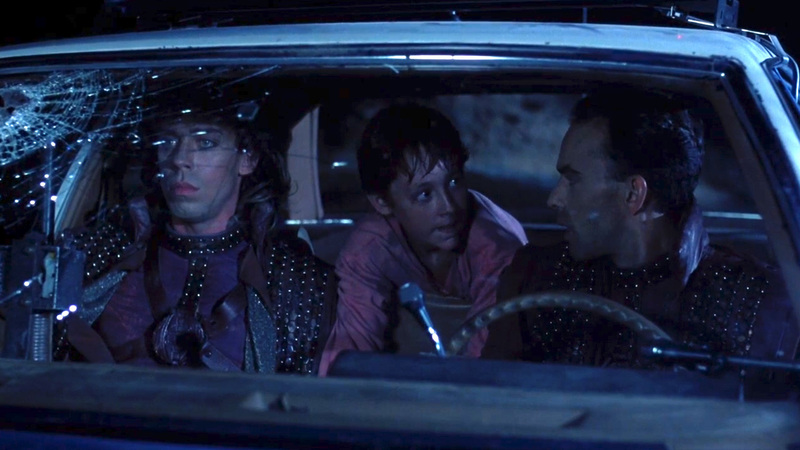 But in my 20s, when the movies hit DVD, I initially found the sequel a little too goofy, and felt a new respect for the first film; I found its mixture of high concept sci-fi with a small, personal horror story boldly experimental. But then I watched it again in my 30s (about two weeks ago, to be more precise), and was disappointed to realize how poorly it mixed those elements. The rather strange, darkly comic sci-fi material comes in erratic bursts, most of which are just irrelevant business in which Terrence Mann’s Ug asks assorted groups of people, “Where are the Crites?” Meanwhile, the ostensible A-story, of the Brown family farm being terrorized by the creatures, barely has enough plot to justify a short film, to say nothing of a feature. The monsters show up, the family runs into the house… and that’s it. When the two threads finally meet, there’s no significant character, thematic, or narrative payoff. By the end of the movie, not very much has happened, and none of it has had any particular impact. Maybe when I watch it again in my 40s, something about it will surprise me and I’ll come around to it again. Okay, it’s not like this one is a bad movie. Heck, there are some portions of it that still work pretty well for me. 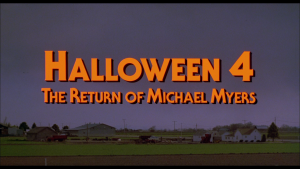 The opening sequence, all the early Dr. Loomis scenes (particularly the gas station confrontation with Michael), the set-up of seven-year-old Jamie , Michael’s niece, as the lead character is a change of pace from standard slasher fare, and makes lemonade out of the lemon of stupidity that was the decision to ret-con Laurie into Michael’s sister in Halloween II (1981). Unfortunately, once the pieces are in place, Halloween 4 has nowhere to go for most of its remaining runtime. It meanders a bit moving characters around before Michael really begins terrorizing anybody we know or care about, and once the killing begins, it’s already crystal clear who’s going to live and who’s going to die. Good direction could heighten the tension, but most of the staging, photography and editing are little more than functional. Thankfully, the movie does pay off in an outstanding ending. Alas, by that point, there’s been too much dull running around for the big twist to have the full emotional impact it should have achieved. 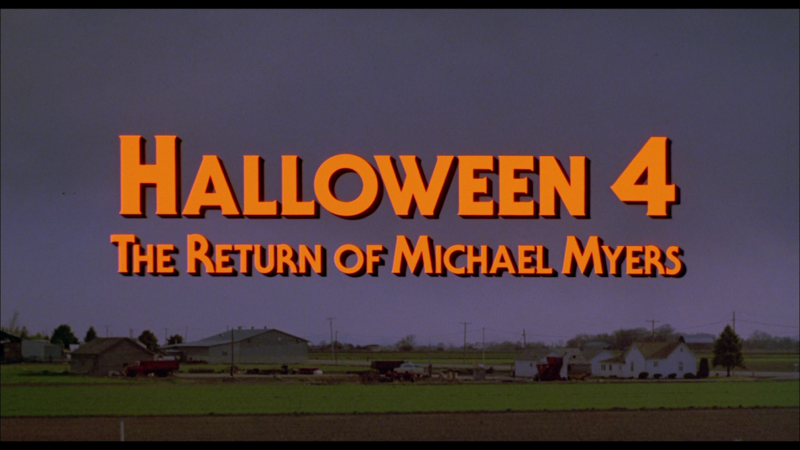 For years, I was accustomed to calling Halloween 4 the one good Halloween sequel involving Michael Myers. 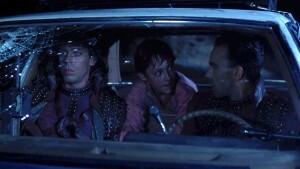 And, by most basic storytelling standards, it does stand as the entry with the fewest outright missteps (and I certainly like it better than the crass, pointless Halloween II); but when compared to the sloppier but more daring Halloween 5 (1989), Halloween 4 just feels routine. 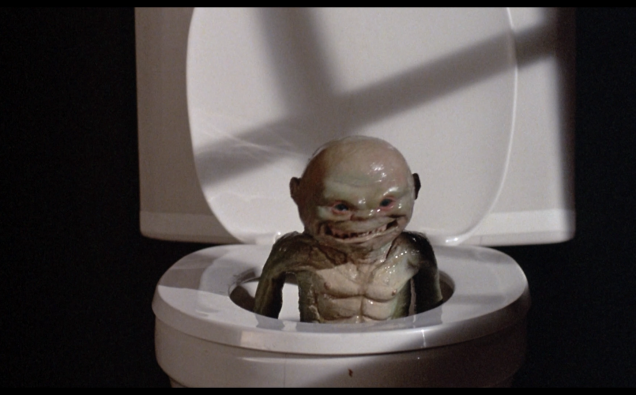 The Blood Shed is home to all things horror, but whenever you can pull yourself away from the site, you might take a peek at our Facebook page! I feel exactly the same about Critters and Ghoulies. Loved them as a child, but seeing them as an adult I realized how much depth they lacked. I think they did their job at the time, riding the coattails of Gremlins and appealing to the 80’s youth and their love of puppets.